When I was younger, I had this really cool all-terrain toy car. It was designed to look like a combination between a race car and a monster, and was capable of flipping itself and performing all manner of stunts. In spite of the fact that it was just a toy, I could drive it just about anywhere. A sort of 'group mind,' similar to that which you'd find in an ant colony. I should explain. Individually, each Swarmie isn't really all that much to look at. It's smaller than any of NASA's other exploration probes, with none of the complex scientific equipment you'd see on its brethren. The only gear it's packing is a Wi-Fi antenna, a GPS system, and a webcam. That's all it needs, though. See, each Swarmie is connected to the others by specialized software developed at the Kennedy Space Center in Florida. Using that software, an engineer can direct the Swarmies to spread out over the surface of a planet in search of a specific material or resource - for example, ice water on Mars. Once one of the Swarmies finds something, it can send a signal via radio communication to its robotic kin, calling over a bigger, more powerful probe to investigate. So, yeah. Basically, they function like wheeled robotic ants. Awesome, right? 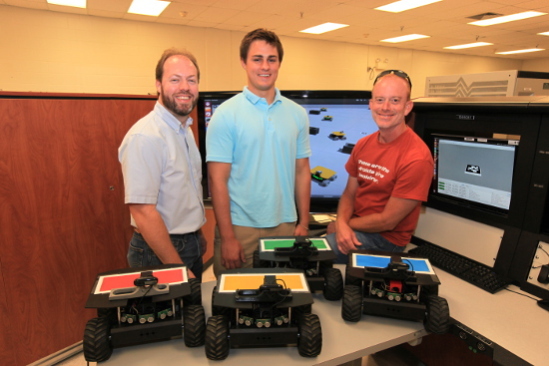 "For a while people were interested in putting as much smarts and capability as they could on their one robot," explained Kurt Leucht, one of the engineers working on the project. 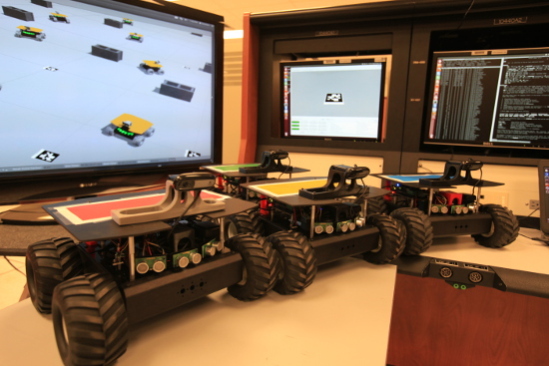 "Now people are realizing you can have much smaller, much simpler robots that can work together and achieve a task. One of them can roll over and die and it's not the end of the mission because the others can still accomplish the task." Currently, the Swarmies are still very much in their nascent stages - engineers are still driving the robots around the parking lots at Kennedy's Launch Control Center; they're only programmed to hunt for barcode-labeled pieces of paper. Once that phase is completed, the engineers will introduce RASSOR - a mining robot designed to search alien planets for valuable or scientifically-viable materials - to the Swarmie network, to see how well they can 'play nice' with other machines. In addition to serving as exploratory vanguards, Swarmies might find a use closer to home, as well, says NASA. Their most obvious use? Search and Rescue. In the event of a natural disaster or a building collapse, a horde of Swarmies could be spread over the crisis zone to seek out survivors, alerting rescuers (be they human or robot) when they're found. Apparently, they'd also make great pipeline inspectors. "This would give you something smaller and cheaper that could always be running up and down the length of the pipeline so you would always know the health of your pipelines," noted project lead Cheryle Mako. "If we had small swarming robots that had a couple sensors and knew what they were looking for, you could send them out to a leak site and find which area was at greatest risk." Swarmies might not look all that impressive; they look more like toys than anything else. What they represent, however, is almost awe-inspiring. Imagine it: an autonomous, connected network of space exploration robots which could be dispatched to just about any planet in the solar system (or even beyond). If you don't think that's even a little cool, then space probably isn't your thing. Fighting Cold War II In Cyberspace With "He-Who-Must-Not-Be-Named"?